About Ed's. All in one place. An Ed's business offers you flexible working hours, work where and when you want it, and a work/life blance to suit you. Ed’s Garden Services "Ed’s" was founded by Ed Mauleverer in January 2003. Ed’s love of the outdoors encouraged him to leave his management consultant job in London and set up his own gardening business. Within a short period of time, Ed’s business was highly profitable and had more customers than it could handle. Ed decided to share his business approach with others and let them join in his growing success. The first Ed’s Operator joined in 2007 and the network has been growing from three to five new Operators each year. 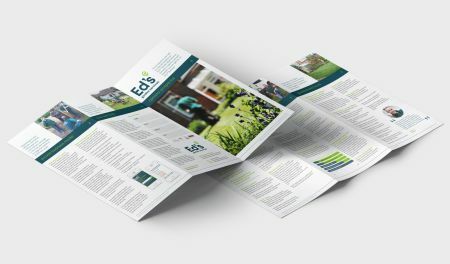 Today Ed’s Garden Services is the UK's largest garden maintenance franchise business with over 35 Operators growing their own successful garden services businesses. Ed’s is proudly a wholly British company and a full member of the British Franchise Association (BFA) which sets ethical standards in Franchising. Ed himself is also a Qualified Franchise Professional. What is an Ed’s business? In short, it can be what you want it to be: a career change, a new opportunity, a lifestyle choice. You tell us what you want it to be and we’ll support you to help you to realise your goals. An Ed’s business offers you flexible working hours, work where and when you want it, and a work/life balance to suit you. Ed’s Operators can choose to offer additional services depending on having the requisite knowledge, experience and/or qualifications. Additional services may include fencing, paving, tree removal, lawn treatment or other garden related jobs. Most of the work will be for private households. It will be a mixture of on-demand work (people will call for a one-off job to be done as soon as possible) and regularly scheduled, repeat business. However, we do deliver some commercial work too. You may choose Ed’s because you want to own your own business without taking too many risks, or because you already have a business that is not as profitable as you would like. You may wish for a change of lifestyle or a chance to make good money with the aim to sell your business when you are ready to move on. Ed’s helps build your confidence to acheive your goals and aspirations. Ed’s provides the framework and support network to Operators to help them set up and grow their own successful businesses. Ed’s provides guidance and on-going support to its Operators through training, regular meetings, marketing and advanced computer systems. Everything is designed to make running your own business as easy as possible, so you can concentrate on growing your customer base and enjoy in your success. A chance to be your own boss and run your own business within the support framework of the Ed’s Garden Maintenance brand - less risky than setting up a business on your own. A tried and tested business model - you benefit from the experience of all the Operators who have joined Ed’s before you and you can be confident that the business model works. An Initial Work Guarantee for new Operators. Under this unusual system you are guaranteed enough work to provide you with instant revenue to get you started. Ongoing support to all its Operators. We want you to succeed and grow your business. A bespoke system that ensures a rapid response to customer queries, and allows you to manage your business from your mobile. Complete visibility into your business so you can make the right decisions on how to increase your business or improve your lifestyle. A pipeline of new business sourced through the Ed’s Garden Maintenance website, generating on average over £10,000 per Operator in 2014. Marketing plans that mean most Operators generate over £35,000 in their first year and in exceptional cases over £60,000. Joining Ed’s means growing your success for your future. Later on, if you want to realise the return on your initial investment, Ed’s offers support in selling or splitting your business and help with the smooth transition of your customer base. Those Operators that have wanted to split or sell their business have done so. Earn much more than an Independent Gardener. The administration centre provides a continual stream of customer enquiries – much more than an independent gardener can generate alone. Jobs are priced individually – not per hour – so you’re not restricted by a low hourly rate. The equipment you will use allows you to complete jobs faster, so you can complete more jobs – and earn more money – each day. You will receive ongoing training, support and business coaching to ensure that you are able to grow and improve your business. There are regular Operator meetings to review your business and offer advice to help you achieve greater profitability and a business coach is at hand to help you understand where improvements can be made. Ed’s is unusual in that it offers an Initial Work Guarantee for new Operators. Under this system you are guaranteed enough work to provide you with instant revenue from the day you start. Depending on your goals and aspirations, there are many options available to you. 3 Being part of the largest, most established and growing garden	maintenance franchise business in the UK. All Ed’s Operators share an administration centre that receives and distributes customer enquiries. Calls are professionally answered, and each customer’s information is collected and verified. The details are forwarded to you instantly, wherever you are (probably on the road already performing jobs). You are then responsible for contacting the customer directly to arrange a meeting, provide an estimate and agree a time for the completion of the work. All Ed’s Operators are provided with Ed’s Jobs – a bespoke Internet-based scheduling system specifically designed to save Operators administrative time and to enable you to focus on delivering the best possible service to customers. It gives you access to all customer details in real time, whenever you connect to the Internet, and works on Smart phones. Successful Operators tend to provide an estimate within hours of the customer calling and, in most cases, deliver the work on the same day. This outstanding level of service is very effective at converting one-off jobs into regular, repeat business. And you can customise your territory, so you can work wherever you wish. Training starts when you meet us and / or go out on the road with an experienced Operator who will show you how an Ed’s business works. Investing in a new business is a big decision. We ask that you personalise your own business plan to check the figures add up for you. We will then invite you to meet Ed to explain what is involved in running an Ed’s business and answer your questions. Following the meeting we will invite you to spend time with an experienced Ed’s™ Operator. This gives us an opportunity to assess your suitability and your ability to succeed within Ed’s™. We will then meet to discuss your goals and expectations. If we both agree that an Ed’s business is right for you, your Ed’s business can be purchased, your territory agreed, and you can start the Ed’s training. You have already taken the first step towards considering an Ed’s business opportunity. We encourage you to understand the information on this website then ask yourself whether you think you can make a success of this business. If you are interested in an Ed’s business opportunity and would like to arrange a further meeting or a day on the road, please contact us. We look forward to hearing from you.